I thought I'd show you what I've bought over the last two days, mainly from Boots. I'm loving the Boots 3 for 2 deals and I could have bought a lot more but I managed to restrain myself! I bought 3 Models Own nail polishes as I've been after some of the Beetlejuice and Hed Kandi shades. Ideally I would have bought Ibiza Mix but it was the only Hed Kandi shade that was out of stock in my local Boots so I went for Disco Heaven instead. I do really like this one too as it's a lovely gold glitter with blue flecks. The main Beetlejuice shade I'd been wanting was Indian Ocean from the new Spring/Summer collection. It's a gorgeous shimmery baby blue with a pink shimmer when the light catches it. 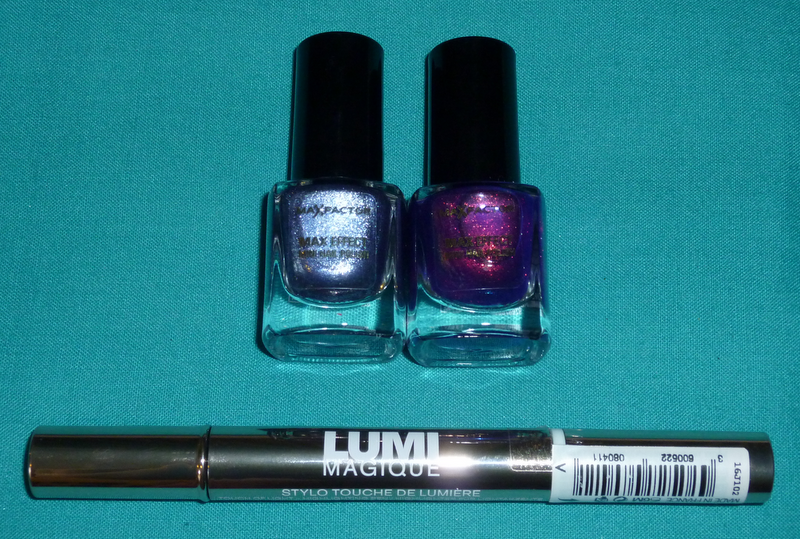 I also went for the shade Purple Blue which is predominantly dark purple with blue shimmery particles in it. After seeing MaxFactor Max Effect Mini Nail Polish in Fantasy Fire on lots of beauty blogs I felt like I had to see what the fuss was about. This colour is amazing! It's a lovely royal purple shade with differing shades of shimmer depending on how the light hits it. I picked up the shade Meteorite too as it's a pretty denim shade with plenty of shimmer in it. So..shimmer tends to be the theme of my nail polishes today! I decided to pick up a new concealer as well since I'm getting a bit bored of my Collection 2000 Lasting Perfection one. I went for the L'oreal Lumi Magique Highlighter Pen. I love the rose gold packing, I just hope the product is great too! I hadn't bought any shower gel for ages as at Christmas I got loads, either as gifts or during sale shopping. 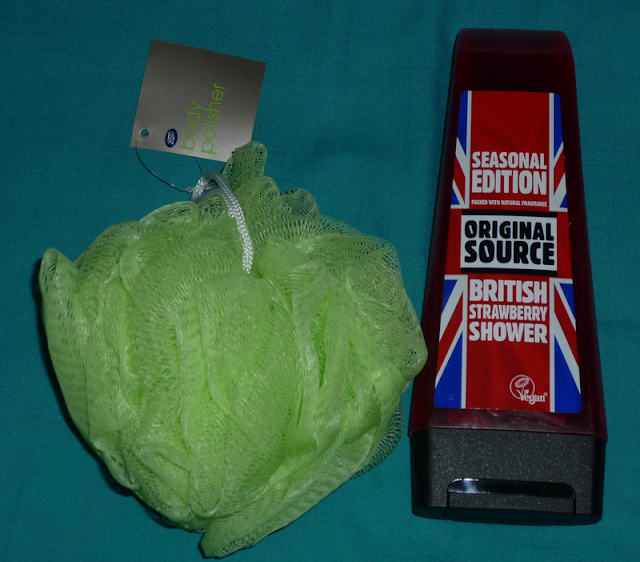 I've started getting sick of the Christmas scents I've got left and fancied something a bit fruity so when I spotted this it was exactly what I wanted - Original Source British Strawberry Shower. I love strawberries so I'm looking forward to using this. I also bought another shower scrunchie as it's always good to have a new one! I've seen these Lily Flame candles for ages now but I wasn't sure whether to pay £8.50 for a candle or not. I tend to buy the Yankee Candles in the sampler sizes as they are less than £2 so it doesn't matter if you don't like the fragrance. I decided to smell all of the Lily Flame candles in Fenwick and this one really stood out for me. It smells like sweets! I love it! According to the website it smells of "sophisticated raspberry". 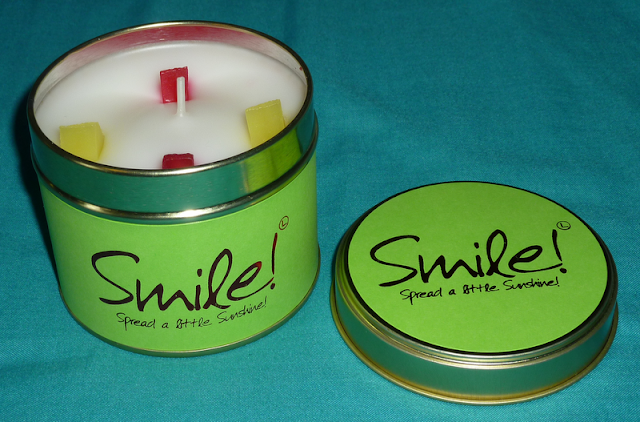 I can't really pick that particular scent out when I smell the candle, I just know it smells amazing and I had to have it! I haven't tried burning this candle yet but apparently you get 35 hours from it so I guess £8.50 isn't too expensive for all that burning time. I love the food hall in Fenwick, it's pretty expensive but you can get lots of interesting goodies from there. I bought some Jelly Belly lollipops today, they were so tasty! I also like the American section where you can buy Hersheys, Pop Tarts, etc. 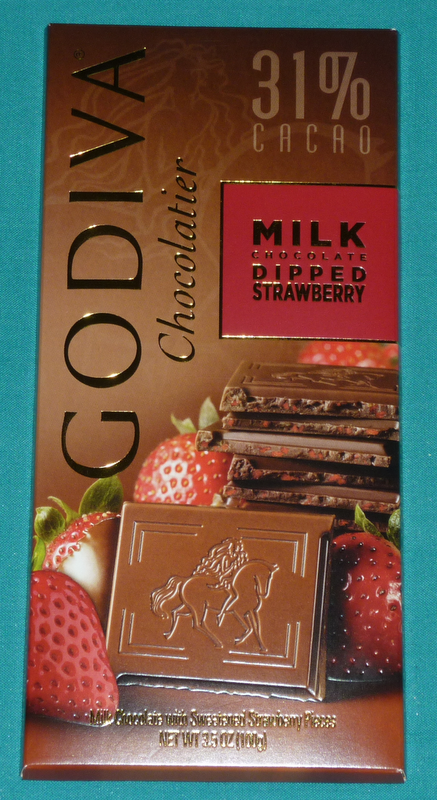 Anyway, I spotted this chocolate bar which sounds super delicious so I had to buy it as a treat to ease the Sunday night blues tonight! It's by Godiva and it's called Milk Chocolate Dipped Strawberry. Yummy!